This ultimate looking bike is the premium entry level segment machine of Bajaj. Pulsar 180 is a stylish bike with a large wheelbase and Nitrox shock absorber. 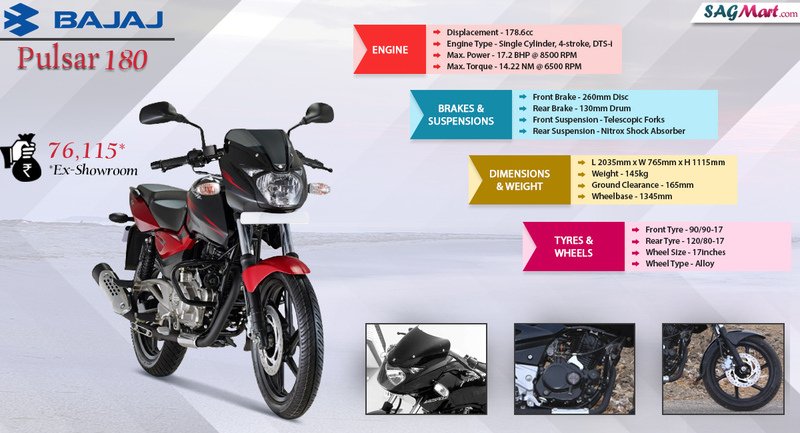 The rear telescopic suspension system, vibrant colors and 180cc DTS-i engine make this bike a must have for you. The Pulsar 180 rides on Double Cradle chassis that provides dynamic riding comfort and handling stability on all terrains. And, it has a clip on handlebars, which gives a sporty riding stance to the riders, while the split seats make the sitting position very comfortable for rider and pillion. The maintenance of this bike is very good and to retain the engine life better, it needs a regular care within a given time interval. The spare parts of this machine will not be heavy on your pocket and it will easily available in the open market or warehouse of the company. The overall built quality and other features help to maintain its position in its category. Bajaj Pulsar 180 is in the market along with four new dual-tone colors such as Cocktail Wine Red, Ebony Black, Sapphire Blue and Pearl Metallic White. The price of this bike is lower than pulsar 200NS and higher than Pulsar 150.